Paul and I had a date night Saturday at one of our favorite local restaurants. We had some calamari with cilantro-lime aioli (amazing!) They have a huge menu but embarrassingly enough, I always eat a salad there. I just can’t help it. It’s mixed greens with dried cranberries, pine nuts, tomatoes, and feta cheese, and a sun-dried tomato vinaigrette. Paul actually laughed at me for most of the meal because of all the things they offer, I choose a salad for dinner. And then, of course, when I finished my amazing salad, I was eyeing the desserts. On the drive home I decided (again, for the millionth time) that I could skip meals altogether. Who needs an actual meal when you have appetizers and dessert? I know I’ve said it before and I’ll definitely say it again. Snacks are where it’s at. 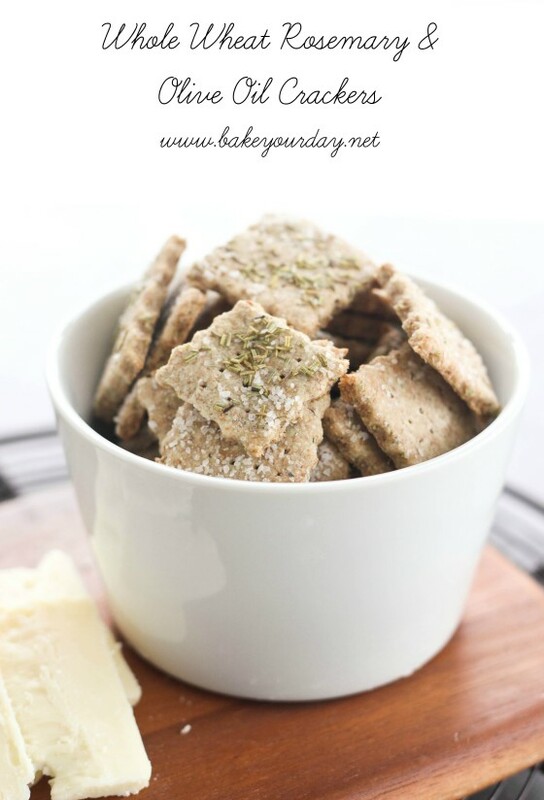 So here we are, a new week, and a new snack: Whole Wheat Rosemary & Olive Oil Crackers! I started out thinking I was going to make a homemade version of wheat thins and then thought it might be fun to put a little bit of a healthier twist on them using olive oil. And you can never go wrong with Rosemary! The best part about these crackers is that they are completely customize-able…if you don’t have any whole wheat flour, you can use all-purpose; if you don’t like rosemary but basil is more your cup of tea, go for it. Maybe you think a little Parmesan cheese would be great in these (it is!) so add a little just before rolling out the dough. The possibilities are completely endless. And best of all, they are so simple – done in around 30 minutes. And they are made even more perfect with a slice of your favorite cheese on top! 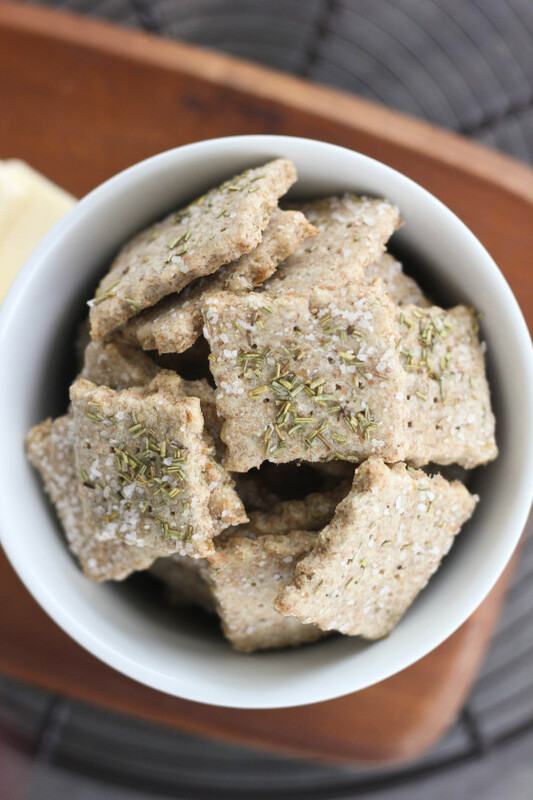 The recipe for these Whole Wheat Rosemary & Olive Oil Crackers can be found on Imperial Sugar’s website, along with many other awesome snack recipes, including some great back-to-school recipes! This post is written by me in sponsorship with Imperial Sugar. I have an ongoing relationship with Imperial Sugar for recipe development. All photographs, text and opinions expressed are my own. Thanks for supporting the brands that make this blog possible! We should probably re-order dinner so that the main event comes last. Gotta save tummy room for the good stuff! Also, I heart you for making your own crackers. Snack champ of the year! Looks very good, olive crackers are one of my favourite. Ahhh…love rosemary! These look DeLish! Pinned. I am obsessed with rosemary anything! These are awesome!! Awesome recipe! I actually added this to my “After School Snacks” Pinterest board bc I think these are a great, healthy idea for the kiddos! Of course, I’d be using them for wine and cheese hour too! LOL!! I am the same way! Eat salad so you can have dessert! Love these crackers, Cassie! I need to make some myself. I’m all about an appetizer plus dessert! I’m so over big portions of entres! PS small typo ‘sO here we are’ Sorry to be annoying and point it out. From apps/salads and straight to desserts, that’s me 🙂 Great crackers & pinned! I absolutely love when you bust out the homemade crackers. These look great and I’m off to check out the recipe. I’ve never made homemade crackers. I need to add it to my To Do List! These crackers look great! I’ve never made my own before! Those crackers look AWESOME! I could totally skip a meal and just eat cheese and these instead! Olive oil and rosemary are so delish together! These homemade crackers will definitely be made here; they look like the perfect after school snack for my kids. These are fantastic. I love a good cracker, perfect for back to school snacks too. I’m totally an app and dessert kinda gal, too! So I’m all about these crackers, obviously. Love that they’re whole wheat! These crackers look fantastic! I’m a sucker for anything with rosemary and these are calling to me. I love the sound of these crackers Cassie! I’m gluten-free but still could imagine them with another flour blend. The combination of flavors seems perfect for so many things! I could absolutely live off appetizers, in fact, sometimes I just order an app instead of an entree, it’s smaller, and I find that a lot of times, it more interesting! Love these little crackers, a perfect partner for a cocktail! I love this combination of flavors on focaccia so just know how good these little crackers would be! I’ve always wondered how they make crackers, and you can’t beat olive oil and rosemary. I could definitely survive on apps and dessert alone! Love these crackers. Perfect little apps, especially with a good wedge of cheddar or brie on top. Girl, I’m totally in the same camp, I loooove appetizers and small plates, I could subsist on them!! These crackers, I would like a big bowl full asap! I have been trying to grow rosemary in exact hopes of making crackers, now I definitely have to make sure what rosemary I have makes it into these crackers! Can’t wait to try this! I live for appetizers and these crackers are now on the must make list! I am so making these for my Mama, we will devour a batch in minutes!